Despite vowing to get caught up on my 450b load testing, I was once again lured to the "new kid in town". What spurred that was an unintended visit to the Hodgdon Reloading Data web page. They had some loads for the 30RAR. Their listings implied that you could cram 40gr of Benchmark into a case, with the right bullet selection. In my previous outings, I had not gone that high, even writing Benchmark off as not a good choice in the lighter bullets I had tested so far. Well far be it for me to leave a stone unturned. Also, I had seen a theoretical load for the 110gr Vmax bullets in QuickLoad, using AA1680, that I had an itch to try. Enough other loose ends and a few different bullets outside the Hornady 125gr SST were also waiting for their at bat, was enough to spur me on. That and another singular, predicted nice weather day was in the offing on Sunday. Up here, we yearn for the return of comfortable weather each spring and despite March coming in like a lamb, it went out like a lion. So, I'll take a good day whenever one is available, this time of the year. Snow tomorrow. When I first laid eyes on the Hornady 125gr SST bullet, my gut feeling was that it was a good match up for the 30RAR. In practice (see sig), what I saw was with the harmonics of the factory barrel, the faster they went the tighter they grouped, but I was running out of gas on the way there. Well, I found what appears to be an accuracy node around 2870fps. Felt good to get back to the BR rest and bag. Not as rusty as I thought, but this platform weighs somewhere near half as much as the 450b setup with its SS lower and recoil mitigation doo-dads. So I didn't know if I could hold it as steady. I'll let the targets speak for themselves. The Vmax's didn't care for H335, but just wait. Lastly the fun experiment. 36gr (90% fill) AA1680 under the Hornady 110gr Vmax and the obligatory fouler target to make an even number. I think the wind was bumping the 110gr Vmax's a little horizontally. At almost 3100fps average, the Vmax's were really hustling. I knew that the AA1680 modeled a little fast for them, but had to try it. Produced enough pressure to moderately flatten the primers, short of cratering. Case Head Growth reflected the "bridge too far" compared to other loads. Interestingly, unlike the other powders I've tried so far, QuickLoad got this one real close. Coming soon is some AA2200 which might be that slower than AA1680 but faster than any other powder I've tried so far. Hoping for the "missing link". I'm reversing my opinion, Don't count Benchmark out yet, as predicted by Hodgdon. Another great set of data from the Hoot-mon! Both of the 125gr boolits seem to be the ticket for accuracy, so far. IIRC the 30RAR was originally developed with a 125gr load in mind...kinda figures, looking at what you got. Sent ya a PM, too. there's a fair stretch of us using them this way in our blackouts - experiments that happened during the shortage when you couldn't find jacketed bullets that turned out exceptionally well. its one of my more accurate loadings in the 125gr-ish realm and they're VERY accurate. Match the seating depth and use 125gr data and they (at least in my blackout) will produce a mixed group w/ 125 sst that have a SD in the low 30's and an identical POI. they're relatively cheap - graff's has them as a private label under item number HRN3142G 123gr vmax @ $0.23 per or you can buy them as a regular 3142 SST @ $0.32 per or 3143 as the green tipped zmax(500 ct) @ $0.26 per. if you'd like a few to play with - already resized or untouched - drop me a PM and i'll send a few your way to experiment with. Ooh! I'd love some of them to play with. Both unsized and resized. Say, 6 or each (1 to play with, 5 to load)!!! Heck I gave them a long look for my 7.62x40 a year or two ago, but was drawn to the 110 grainers in that caliber. 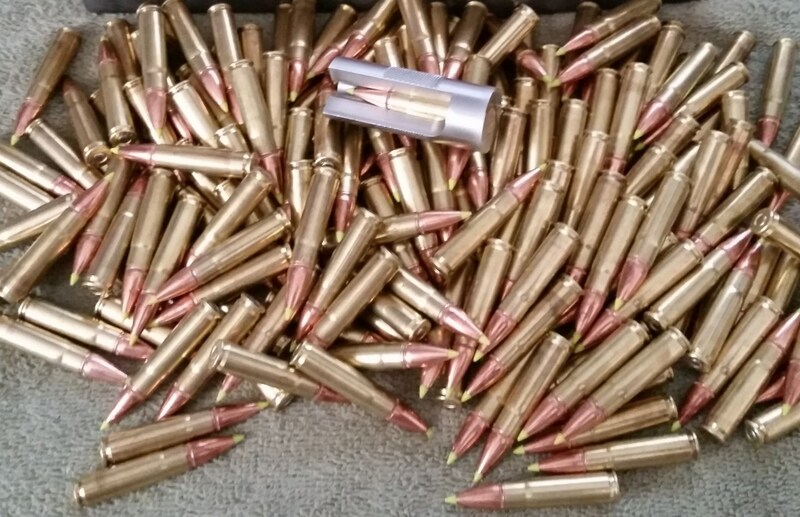 Given the uncertain life expectancy of this brass, I'm not looking to make "blammo ammo", but I'd still like to load a run similar to the 125 SST. Their profile looks more like the SST line than the Vmax, with that cannelure. they're very similar, the 123 is a little stubbier. i use the same seating die settings just out of pure lazyness - i'm seating the 125 SST to 2.100 and that gives me a 2.082 for the 123 zmax - a little less in the case mouth, but whats .020 amongst friends right? depending on the throat/freebore/neck area in your chamber, and the neck thickness of your brass - you MAY be able to run them unsized in your gun(s) too. you'll have to load some dummies up and see if they plunk in your chamber or not. there's a couple folks on the blackout forum who are doing so, but its a very chamber dependant thing usually because of exceeding chamber's ID in the neck area, especially for the folks pushing the upper area of brass neck thickness. So, the 123 Zmax gets up to caliber quicker. That may allow loading them close to the lands without exceeding magazine length limit. The Sierra's were jammed .040 into the lands. That was not my plan initially. 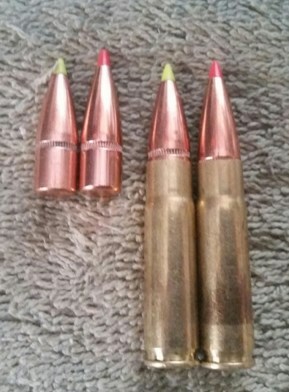 I intended to seat them to 2.10 COL, but with the unfired brass, the lesser case capacity caused the heel of the bullet to bottom out on top of the already compressed powder column at 2.15 COL. So I gave that a try. I can only speculate that perhaps they would have shot as tight as the SST's had I started them back a little from the lands. Speculation is cheap though. Only testing will tell. So far I have not seated anything less than .259 into the case and ideally I would prefer seating a caliber of depth. I'll tell you though, the bullets hold on for dear life. On one of my loads, I over-seated one while adjusting the die and had a dickens of a time coaxing it back out with an inertial puller. My Redding die set uses a mild taper crimp when seating. Seems to really do the trick. Certainly a lot better than the 450b accomplishes, but then the 30RAR is a much tighter circle and the bullets weigh a heck of a lot less. A bullet I wished I had not squandered away most of. Actually two bullets, were the Hornady Monoflex for the .30-30 and the .308 Marlin Express. The 140gr ones not the 160gr ones. Might be an interesting match up. Their only shortcoming was they had a real long boat tail as boat tails go. Powder robbers. A bota tail bulet on a .30-30 is akin to lipstick on a pig. The .30-30 version came up to caliber quickly as well. Back when I had my 300 OSSM, it had an ungodly long leade, something like .35 and I got them hoping to get closer to the lands. Shot like sh** in the 300 OSSM. I still have 8 or 9 of each left. Not enough for an in-depth assessment, but enough for a couple of runs of 4. May try them as a sideshow. Lunch is over, everyone back on your heads. i do use a Lee FCD to 'normalize' my neck tension on most of my loads. real light crimp - just about 1/4 turn from contact with the case mouth. this applies to both of the bullets in the pic above. my setback testing shows that its probably not necessary for me to do this, however i haven't seen any loss of accuracy because of it, so my current take on a light FCD crimp is that i might as well, since i'm not suffering from it and i have the station free in my press. i do NOT crimp with my seating dies on any caliber i reload. 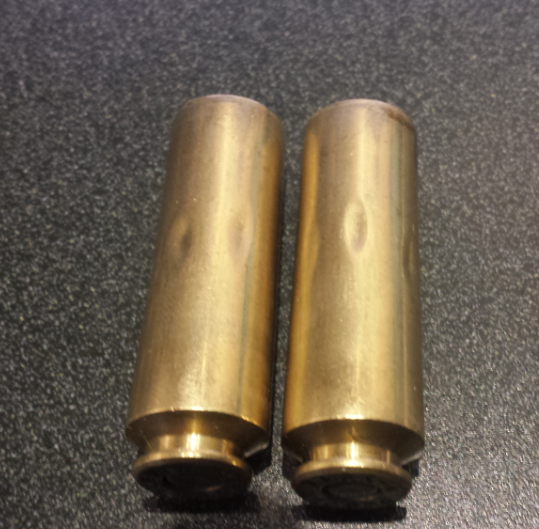 i have not done a crimp/no crimp SD/ES test in the calibers i'm reloading at this time. plant_one wrote: i do use a Lee FCD to 'normalize' my neck tension on most of my loads. real light crimp - just about 1/4 turn from contact with the case mouth. this applies to both of the bullets in the pic above. Looking at your picture, that's a lot less FCD crimp than the factory loads use. They're so heavy, after 3 firings, they're still not ironed out. I tried an FCD cripm on a few of the rounds I tested, but could not see any difference in performance. I normally don't set my die to engage the seating die crimp either, but this Redding set is the first that I've ever had that imparts a taper crimp. Most go with a roll crimp. As I said, its not a heavy taper crimp. You can barely feel it on my single stage press. EDIT: This is my first Redding dies set and like most fools, I didn't read their instructions. When I was resizing my first run of 30RAR brass, I set the die to engage the shell holder when the ram was at the top of it's stroke. Big mistake! Crushed the first case down to about 1.4 inches. Thought I didn't use enough lube, so did it again, before realizing I had to back the die out and slowly walk it in until I obtained the correct shoulder setback. its enough of a crimp to remove belling when using cast without damaging, and keep bullet setback from happening on 6-8 chamberings with regular jacketed bullets, even on freshly annealed case mouths. so while it may look mild, its getting the job done. i've seen what a poorly used factory crimp can do - my friend who has a 50 beowulf experienced that when a mutual acquaintance of ours make his first attempt at reloading be for their beowulf's. he read a few websites, spent a bunch of $ on a hodgepodge of used equipment, fired a couple shots over a chronograph from gun a (his gun) and proceeded to load up just over 300 rounds. the initial test loads his FCD was set right, but somewhere along the way (after the first batch of 20 or so max charge test loads he chroned from what i can tell based on the 7 bullets that were properly crimped out of the mess i pulled apart) got it WAY wrong. like case separation on the first trigger pull in gun b (my friends beowulf) way wrong. thankfully the front half of the case stuck in the chamber so he couldnt chamber another round and it stopped them from possibly getting injured. i didnt even know you could get lube dents on straight walled cases. i thought that was only possible on the shoulder of bottle neck cases. he left so much lube on the cases some of the powder was clumpy comeing out when i pulled them. i had cases that i had to scrub the powder out with a brush there was so much on the insides. one of the 'finished product' that i kept as a souvineer. the winner of this OOPS award gave up reloading as a hobby after this spectacular first attempt failure and from what i was told said "i'm goign back to buying the good stuff"... meaning factory ammo. plant_one wrote: they're very similar, the 123 is a little stubbier. Finally got around to musing about the advent of spring and returning to testing more 30RAR loads. 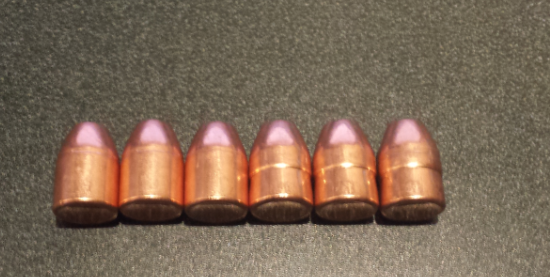 I took those resized Zmax bullets and measured the distance to lands (DTL) in a resized 30RAR case. Boy talk about a great fit! They hit the lands at 2.246 COL. About as perfect as you could ask for. I'm not sure what transpired other than fickleness of popularity, but they want more per bullet for the .310 Zmax than the .310 SST bullets now at Midway, although the .310 SST are out of stock at the moment. Really want to test them across my selection of powders, which now includes AA2200, before buying a box of 500, which Midway does have in stock at the moment. If they shoot well in the 30RAR, they could well be the goto load for this caliber. Given the dismal performance gap in terms of real velocity, versus what QuickLoad predicted would happen during calibration load testing, I'm hoping that AA2200 will do better. Trying to get better load density. For the 100 grainers which I have waiting in the wings, AA1680 modeled and performed a little too fast, but the new CFE Black is supposed to burn a little bit slower and may offer a win-win opportunity. One of these days, I'll post up my 30RAR DTL spreadsheet for the bullets I have on hand. I've now measured 17 different bullets. Thought I had posted it somewhere here, but can't find it to update it. My memory is no about as long as my ... in February. Got some other excellent bullets waiting in line to test as well. I only have some pulls, so I'm reluctant to reload them, but 125gr Sierra Match Kings have an attractive DTL as well at 2.235 COL. Trying to maximize powder capacity, DTL and fit them in an AR magazine in one fell swoop.